Ever since I tried Trust's Chicken Liver Mousse, a luscious buttery spread with a hint of herbs and sweet liqueurs, delivered via a slice of grilled sourdough levain and accompanied by a tangy mostarda and sliced radishes, I knew I wanted to learn how to make it. Well, it took awhile. After all chef/owner Brad Wise was about to open a new restaurant, Hundred Proof. But I finally got my chance in September and got Wise's tutorial on how to make this classic dish. 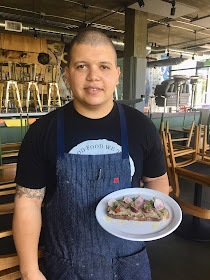 Wise, who's from South Jersey, has been cooking since he was 12 in pizza kitchens and eventually as lead line cook in a fine dining restaurant. 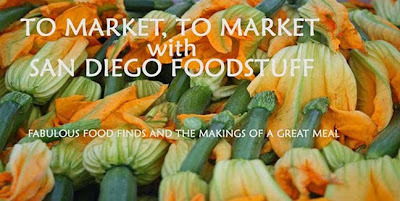 He attended culinary school and came out to San Diego with some buddies at the age of 21, some 11 years ago. 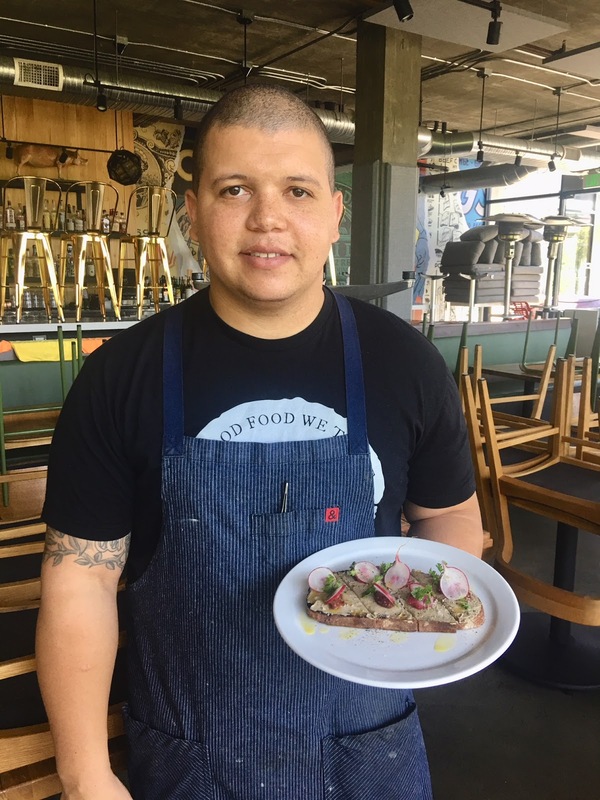 He started out at JRDN at Tower 23, served as executive chef at The Padre Hotel and most recently was executive chef at Belmont Park's Cannonball & Draft. Wise may have spent time in fine dining but his passion is for rustic contemporary American. "It may not look great on a plate, but it's what I really like to prepare. I'm a wintertime type of guy," he said. 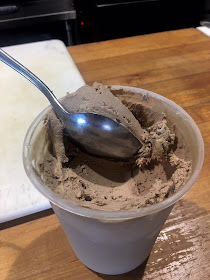 That, of course, explains the Chicken Liver Mousse, which has refined flavors but he serves in a very rustic style. The process for making it is very simple. And pretty quick. But you have to build in the time to prep the ingredients. You've got to soak the chicken livers in milk overnight. You'll need to slice shallots, stem and mince herbs, zest a few lemons, and cube a lot of butter. But once you do that, then the cooking process takes about 10 minutes. Oh, and then you need to let the creamy mixture sit in the fridge for at least five hours to reach the right consistency. Then before serving, take it out and let it sit at room temperature to soften. 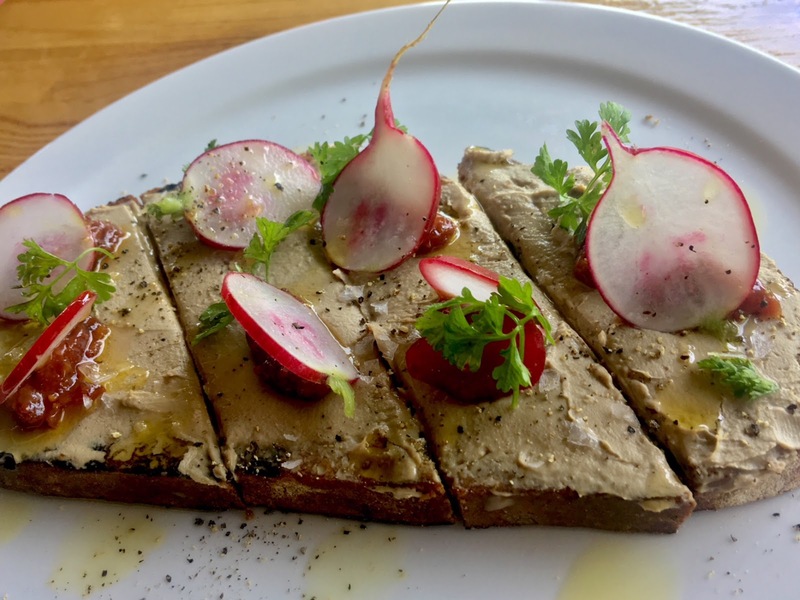 Trust's Chicken Liver Toast is one of their most popular dishes--what Wise called a "portion of a charcuterie board in a bite." He said they make about 2 to 3 gallons a week, using five to nine pounds of liver. For this recipe, you'll only need one pound--and to be honest, once I made it I could see it could feeds scores of people, making it a perfect dish to prepare for a large party. The directions are straightforward, but I have a couple of tips from Wise. A key one comes while you're sautéing the livers and shallots. You want the livers to be thoroughly cooked but not overcooked--think medium rare in a steak with a pink, not raw, center. You accomplish this by slicing into the larger livers as soon as you think they're almost done. If they're still on the red and mushy side, keep cooking--but remove the small ones so they won't overcook. Keep testing until they reach that sweet spot. The next tip has to do with seasoning. Wise adds a good amount of salt to this dish. Consider what you'll be serving the mousse with. Ideally, you'll include a sweet/tart preserve, perhaps whole-grain mustard, and gherkins or cornichons--and the mousse will be served on a hearty bread or cracker. They all function as a way to add flavor, yes, but also cut the intensity of the fat. With that in mind, you'll want to punch up the mousse with more salt than you might otherwise think is appropriate. I found, as he salted, stirred, tasted, and added more, that early in the seasoning exercise the mousse seemed too salty. Then he actually added more, stirred and gave me a taste, and somehow the saltiness gave way to a more full-bodied flavor. Finally, this is a dish you can prepared days in advance. Wise's trick here is to prepare it, then melt some more butter and pour it over the finished mousse in its container or serving dish. Refrigerate and then before serving, remove the congealed butter lid from the top and toss it. The cold butter will seal the mousse. As for serving it, you can see here how Wise prepares the dish. He smooths the mousse over the grilled levain and slices it, then strategically spoons on mostarda and places thin radish slices and chervil on top. Then he finishes it with a drizzle of extra virgin olive oil. You can also pour the mousse into a concave serving dish and place little bowls of preserves, mustard, and pickles nearby. Slice up a sourdough baguette or levain and let it sit out all day to get just a little stale (another Wise tip) and serve that with the mousse. 1. 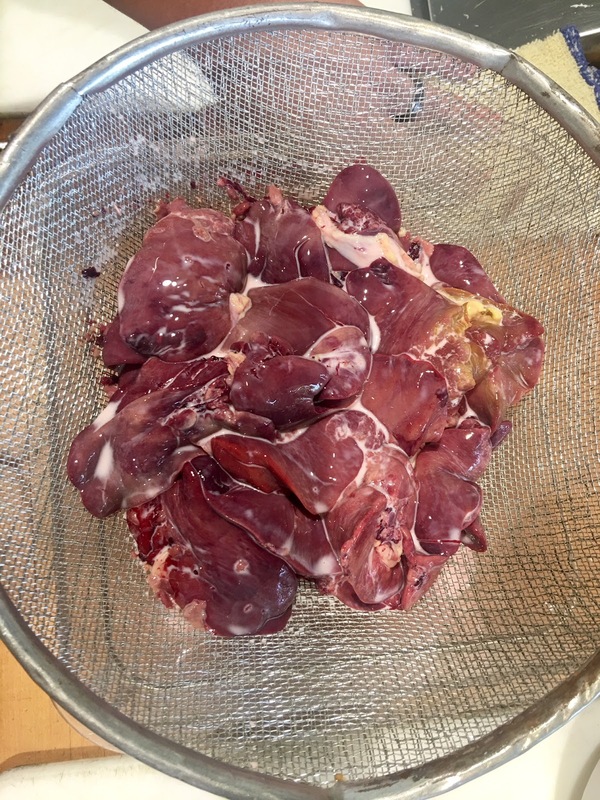 Soak chicken livers overnight in milk. Place in colander over a bowl and drain. Put napkin on top of livers to soak up additional moisture. 2. Place a large skillet over medium high heat and add oil. Sauté shallots until they just start to brown. Stir in herbs. Add livers and cook until the middle is pink but not raw—medium rare. To check on doneness, cut through the thickest part of the livers. 3. About halfway through the cooking process, deglaze the skillet with the liquor. Reduce the heat as the livers absorb the liquor. Add the salt and stir well. 4. Once the livers are cooked, turn off the heat and let sit about 20 seconds. 5. Using a heavy-weight blender, like a Vitamix, add the liver mixture, scrapping the skillet clean to get all the bits included. Add the cream and the lemon zest. Blend until smooth. 6. Take off the top and slowly add the butter while at medium/high speed. Add a pinch more salt while mixing. 7. If you want, you can strain the mousse mixture through a sieve. Stir the mixture and add more salt until it’s just a bit saltier than you think you’d like, taking into account what you’ll be serving the mousse with, such as whole grain mustard and jam. 8. Pour the mousse into a concave serving dish and refrigerate at least five hours to let it firm. You can make this several days in advance. 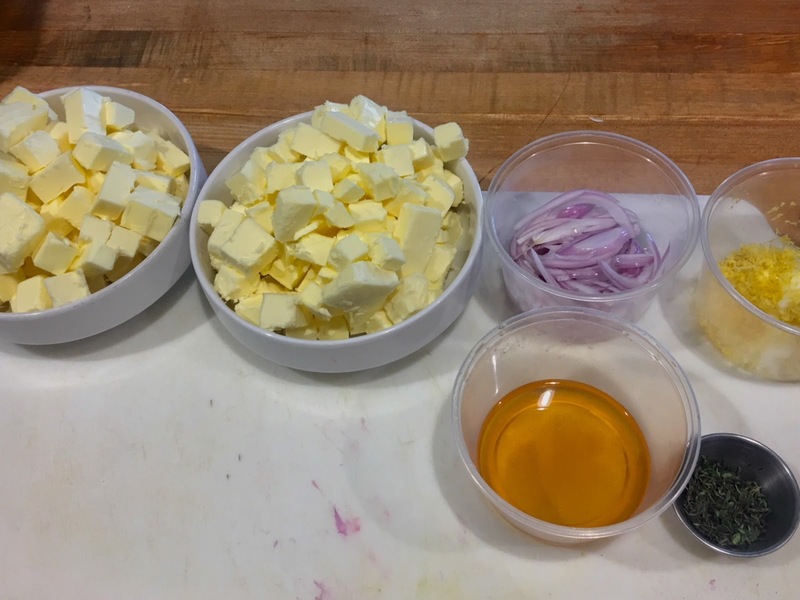 To keep it fresh, melt butter and pour over the top to seal it and refrigerate. Before serving, lift up the congealed butter top and discard. Trust is located in Hillcrest at 3752 Park Blvd.